The Westfield Comics Blog posted a brief interview with new Daredevil writer Mark Waid this past week that shed some light on one new cast member to come Matt Murdock’s way this July. Anyone who knows me (or has been following this blog for any amount of time) will know why that alone would have me jumping for joy. While Daredevil is – and should be – primarily a superhero comic, and not an after-school special, I’ve long had the feeling that writers actually go out of their way to avoid this topic and Waid apparently not being afraid to tackle it is very good news to me. 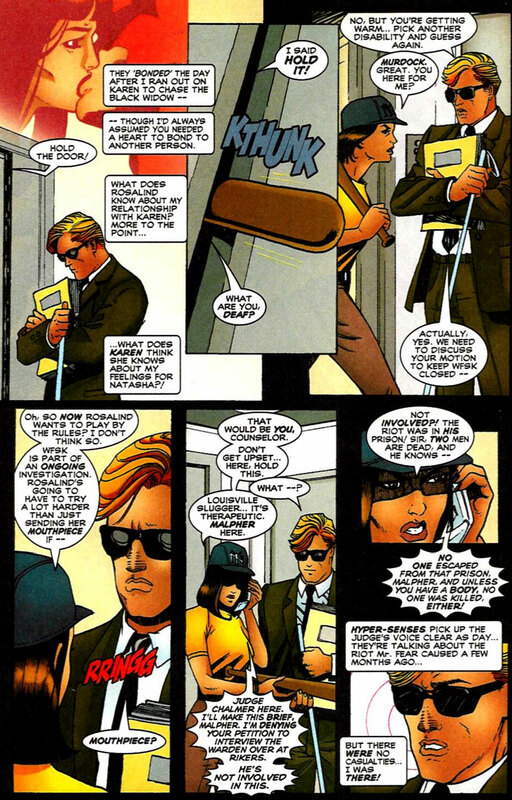 On the topic of Matt getting a female legal professional from “the other side” to interact with, I thought I’d offer these pages from Daredevil #372, by Joe Kelly and Ariel Olivetti, featuring Matt and D.A. Kathy Malpher (originally introduced during the Chichester run as Kathy Malper). Those two had good chemistry! P.S. Paolo Rivera also posted a new update to his blog in which he talks about finishing the first half of his first issue of Daredevil, so be sure to check that out too. His blog is a nice place to visit generally, so I’d definitely recommend getting acquainted with it if you haven’t done so already. @Christine – Is “Mark Waid” your secret identity? And now you’re using that identity to write the DAREDEVIL you’ve always wanted? I’m on to you! That said, yes DD would be unable to see things on screened devices which are increasingly prevalent in today’s world, but he can and should still use them. How? Well, there is assistive technology for the blind (I know Christine has talked about this) such as software that reads text aloud on both smartphones and traditional PC’s. I use a hearing aid as someone with a congenital defect. Thanks to modern technology I don’t have to just accept that there are some things I can’t hear under certain conditions. And believe me, Matt would use modern technology to navigate the world, just differently than a sighted person would. That to me would be a more contemporary approach and I am not sure if Mark Waid or anyone else is thinking of that just yet. I wholeheartedly agree (not surprisingly) and I do think we’ll see more of this. Will get back to this one.